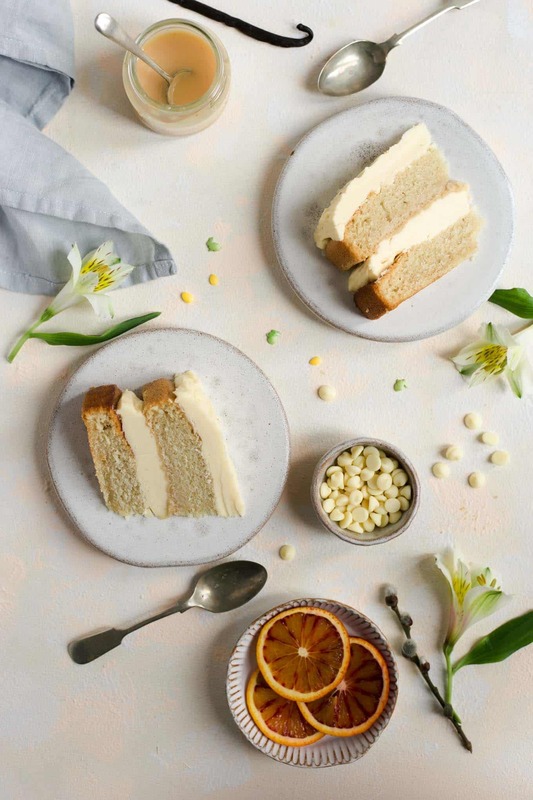 This beautiful vegan white chocolate cake with blood orange curd will be ideal for any special occasion, holiday or gathering! Delicious, super indulgent, and easy to make! …and just like that, we are into another, new week! Where does the time goes?!? Can you believe we are now heading towards the Easter holidays, and any moment now, the longest Winter known to human race will be over? Me neither! But the season change is definitely in the air, days are getting longer, and much to my joy, the temperatures are starting to hit the double digits! Whooooop! 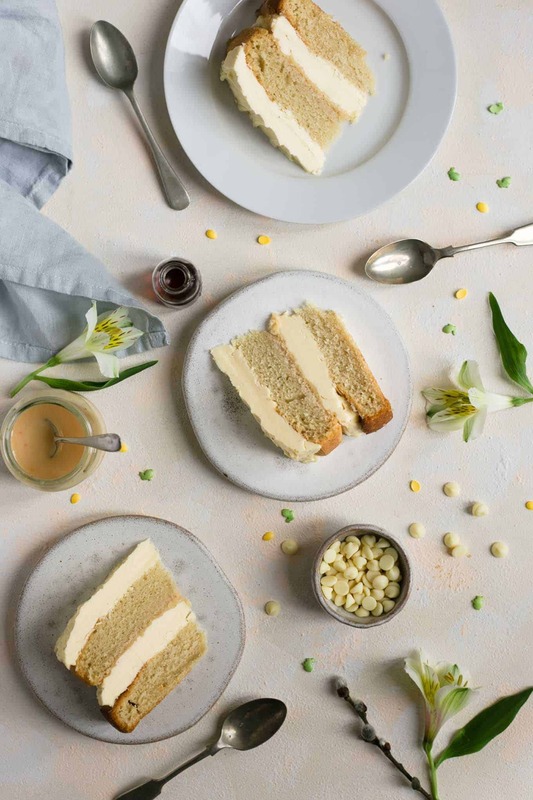 So, to celebrate the change in season, as well as the upcoming Easter holidays, I have this special vegan white chocolate cake for you today! And to make it even more special, it has a hidden layer of the blood orange curd inside! Initially, I’ve had this idea in my head to re-create one of the Easter recipes I’ve made last year. This Lemon and Thyme cake, to be precise. But after creating this recipe for the blood orange curd, I really wanted to put some of this beautiful curd into a good use, and so… here we are! I must admit, the flavour combination, is rather unusual. Blood orange and white chocolate is not something you see or hear of every day. But, in my humble opinion, both work absolutely beautiful together! The sweetness and indulgence of white chocolate is balanced out with this thin layer of slightly sharp, light and citrusy blood orange. However, if you are not a fan of curd, or a blood orange, you can easily just skip it from the recipe, the cake will still taste heavenly! For the sponges, I’m using the recipe based on this one, with a couple of amendments. They come out beautifully light and soft, just how the sponge should be, and you would never tell they are vegan! The recipe for the white chocolate frosting was based on the recipe from Wallflower Kitchen, but I have changed it slightly, after experimenting with it. 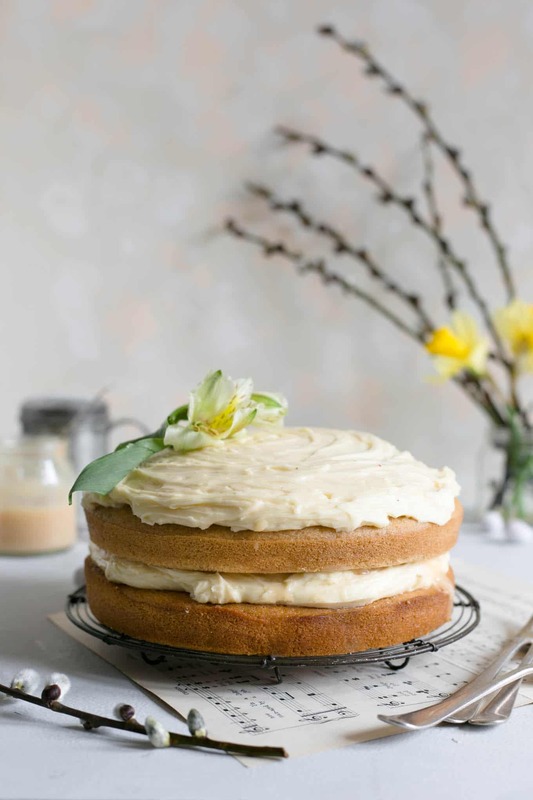 What is also worth a mention, is that there is actually a simpler and quicker method for making vegan white chocolate frosting, where you can use a mixture of icing sugar, vegan spread or margarine and vegan white chocolate chips. For this easier version, check out the recipe notes. 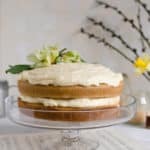 This vegan white chocolate cake will be so perfect for any special occasions, holidays or family gatherings. It will make a perfect centrepiece for your Easter table, or an afternoon tea with the girls (or boys!). And, as with every decent cake, it’s not meant to be healthy, it is meant to be indulgent, rich and very satisfying. At the end of the day, it’s not every day that you will eat such a special treat like this! I have every trust, that you will love this cake, but as always, let me know your thoughts in the comments section! Talk soon, and until next time! 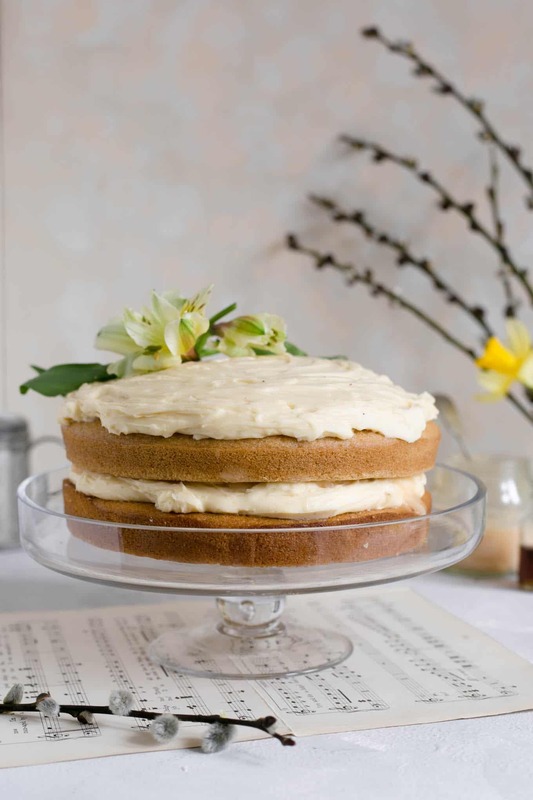 Delicious, indulgent cake with white chocolate frosting and blood orange curd. Ideal for any special occasion or holidays. Perfect for family gatherings! For the blood orange curd recipe, see the recipe notes. Pre-heat the oven to 180C (160C fan assisted). Grease and line two cake tins (I've used 20cm). In a large mixing bowl, mix together the oat milk and apple cider vinegar. Set aside for about 5 minutes, until the mixture curdles. Add caster sugar, vegetable oil, vanilla and orange zest, and stir until combined. Using a separate bowl, sieve together the flour, cornflour and bicarbonate soda. Using an electric mixer, add half of the dry mixture into wet ingredients and mix until well combined, then tip in the remaining flour mixture and keep mixing until smooth and well combined. Transfer the cake batter into prepared cake tins and bake in a middle shelf for about 30 minutes, turning the cakes half way through (to ensure even bake), until golden brown, or inserted skewer comes out clean. Allow the sponges to cool slightly, then transfer into a cooling rack. Place the cocoa butter in a small saucepan and allow to melt on a very low heat. Add maple syrup and set aside to cool. In a blender, whizz together the oat milk with cornflour, then transfer into a medium saucepan and bring to boil, stirring constantly. Set aside and allow to cool slightly. Place the margarine or spread in a mixing bowl with vanilla bean paste, and using an electric mixer, keep mixing until light, pale and fluffy. Very slowly, start pouring the cocoa butter mixture, a little bit at the time, until it's all well incorporated. Add milk and cornflour mix, again, a little at the time, until the whole mixture is super smooth and very well combined. Set the mixture in the fridge for about an hour, allowing it to set and harden a bit. If it hardens too much while in the fridge, give it a good stir again, before topping it on the cake. Spread about half of white chocolate frosting evenly on top of one of the sponges, then add 5- 6 tbsp of blood orange curd on top, and carefully spread it all equally. Place the second sponge on top of the first one, and top up with the remaining frosting, spreading evenly on the surface. Enjoy! For the blood orange curd, use this recipe. 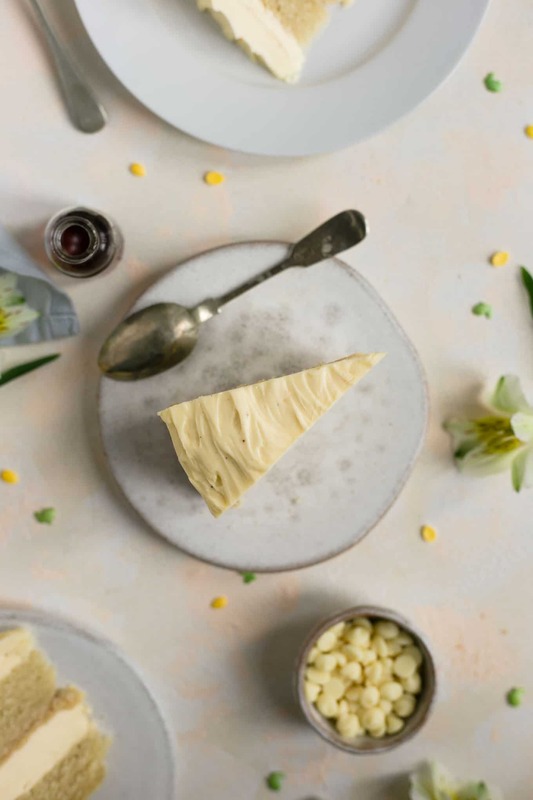 In a mixing bowl, beat together the margarine with icing sugar until well combined, then slowly pour in the melted white chocolate mix, and whisk until well combined an super smooth. Cooking and prep time does not include time required for chilling white chocolate frosting (if using the cocoa butter method). The cake looks so fluffy! 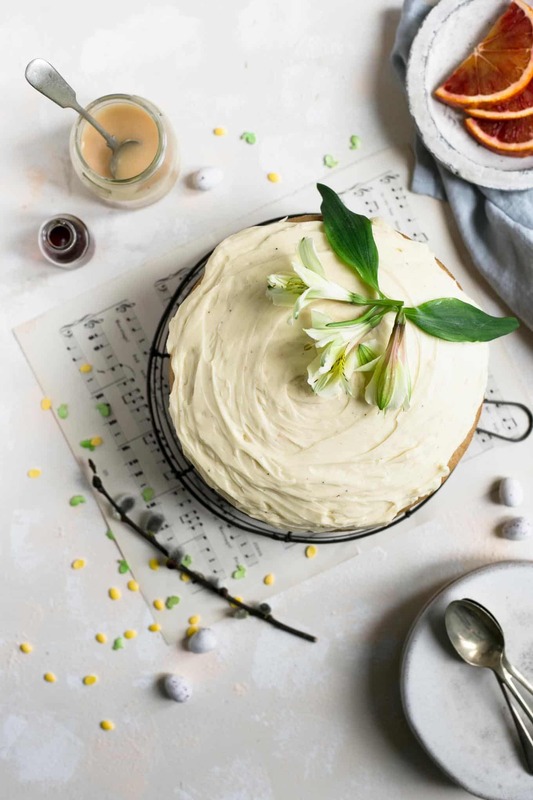 Such a perfect spring cake. I love adding orange zest to vanilla cakes and cookies for some extra flavour! Thanks so much for stopping by! And yeah, same here, a bit of lemon or orange always works so well with cakes! Tania, you always lift my spirits up girl! Thanks so much! As soon as you’re back from your holibobs, we are sitting down to eat a whole of this cake!!!! Oh my Anna, this sounds delicious! And yes, where is the time going!? Can’t believe Easter is almost here. I don’t think I’ve ever had this combo before, but if you say blood orange and white chocolate go together, I’ll take your word for it! I know, I feel like Christmas was just a moment ago, and now Easter!?! But I guess it falls really early this year, and that’s why it feels like it came around so fast! And oh gosh, you MUST try this combo! They work together beautifully! and thank you so much for stopping by! Hahah, I’m glad you also feel it Ann! And you are so right, the sweetness of the chocolate works so well with sharper taste of citrus! I hope you will get to try it some time soon! Wow! What a gorgeous cake. I bet the blood orange curd really elevates the flavors! Thanks Jenni, it really does! And it balances it all out nicely too! That curd is so good, could be eaten straight out of jar! Hhahaha! And glad you like the cake! First, I have to talk about your photos. They are great and I love the surroundings of this cake! Next, I have to mention veganism. I am not a vegan, but will totally eat anything that has good flavor and this looks like it has good flavor. Ben, you’re too kind! Thanks so much, I’m flattered to hear you like my photos and the recipe so much! I really hope you will get to try this one sometime! Haha, it surely will Dawn! A slice of this beauty and a cuppa would be my idea of heaven too! Glad you like it! Thank you so much Natasha! So happy to hear that! Thanks so much Paul, that is so great to hear! Let me know when you do try it out! White chocolate is the best! 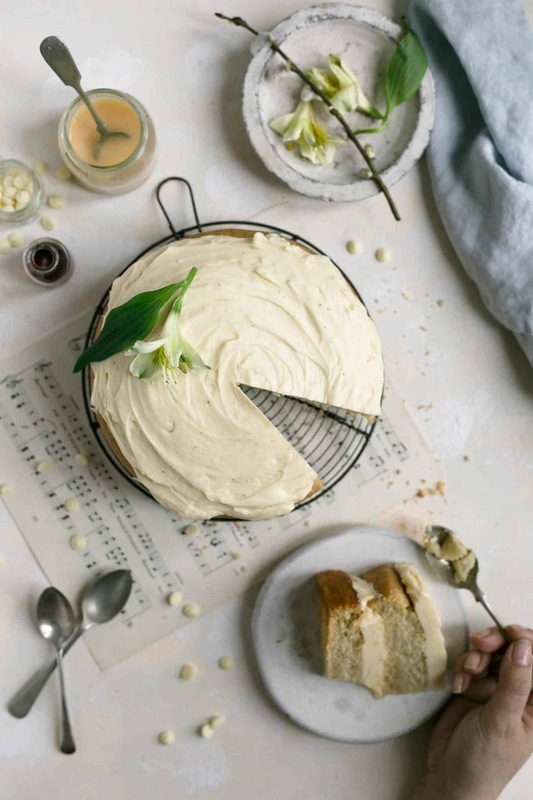 Really wished I could make this cake right now – but we decided to skip the long, awful winter this year and escaped to Thailand : ) No kitchen equipment for recipes like these but 30° C! Hey Alena! I’m so jealous right now! 😉 And I will happily swap the cake for some time in Thailand any day! Have fun! I love everything about this! Sounds delicious, and the photos are beautiful. Thank you so much Jenny!That’s great to hear! Haha, sorry, not sorry! Thanks so much, I hope you will try it some time! would you be able to make cupcakes out of this recipe instead? I have not personally tried that, but don’t see why not! If you do try to make some cupcakes with this recipe, I would love to see the results! Let me know!